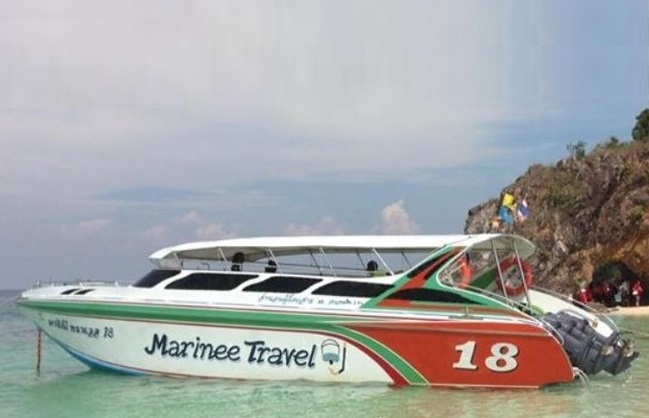 Marinee Travel is an operator based in Thailand that offers ferry services for passengers to travel around the famous island routes in Southern Thailand such as Koh Lipe, Koh Bulon Le and Koh Khao Yai. Marinee Travel covers ferry routes between Koh Lipe in Thailand to Langkawi in Malaysia. The border crossing by sea is to improve transportation transfers for tourists who are travelling between the two countries. Marinee Travel provides speedboat transfers as they are quicker and easier to get around in the area. Besides that, the company also offers various snorkelling packages, speedboat rentals and van transfers. This gives the tourist a convenient alternative to enjoy the trip to the islands of Thailand to the fullest. Marina Travel promises comfortable ferry service with affordable ferry ticket prices that are available now on Easybook. Marinee Travel supplies two-engines speedboat with 3.3 metres width, 13 metres length and 2-3 metres in depth. The speedboat has the capacity to carry 28 passengers and two crew members. Essential amenities on the speedboat are cushioned seats and life-jackets for passengers to have a smooth yet safe sailing journey. The open speedboat concept by Marina Travel will also give passengers the chance to enjoy the ocean breeze as well as the scenic island views throughout the entire boat trip. Marinee Travel serves several ferry routes to various islands such as between Satun and Koh Lipe. Keep an eye on the ferry schedule to grab the affordable ferry tickets provided by Marinee Travel through online booking on Easybook today by following a few simple steps.